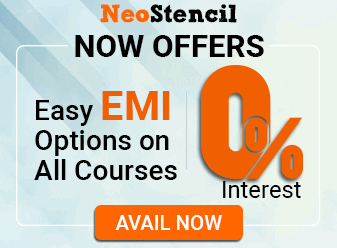 In earlier parts, we learned the MCQ, objective type theory and current affairs for digital payment systems and mobile banking. 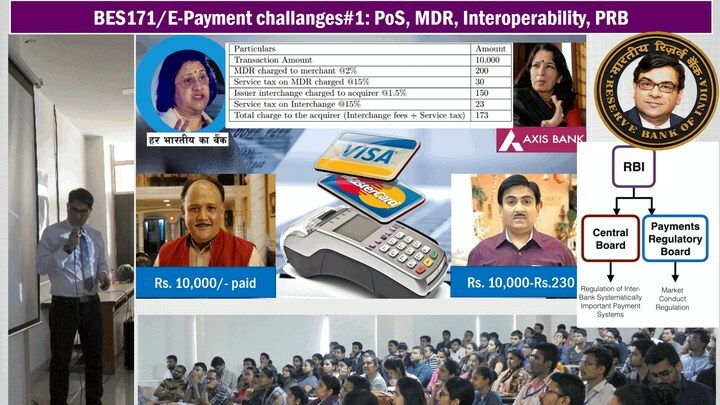 As such, Government of India had constituted Ratan Watal Committee and then Chandrababu Naidu Committee to suggests ways to increase digital payments in India. Later, even economic survey of India and Yojana February 2017 also suggested measures make India a less cash economy. In this session, we’ll look at those challenges and reforms, including the provisions made in the latest budget. On the technical side, challenges include 1) merchant discount rate (MDR) and KYC norms for buying PoS terminals vs latest BharatQR code. 2) interoperability i.e. ability to move money from one platform to another and 3) scams and regulatory structure. As recommended by Ratan Watal, the latest budget mentioned setting up a separate payment regulatory board (PRB) under RBI to take over the functions of erstwhile BPSS for monitoring digital payments. In this episode, we’ll take a look at all three of them- including their challenges and reforms. 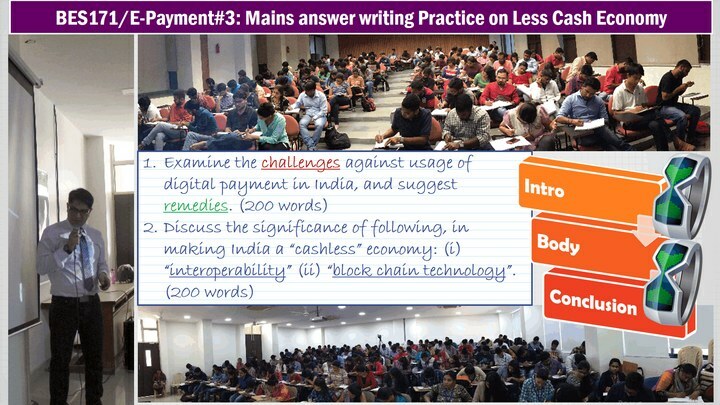 Continuing from the previous episode, here we’ll finish with the remaining three challenges to adoption f digital payment system in India viz 1) Government itself is not role model, 2) lack of financial literacy 3) even those who’re aware, not changing their behavior. 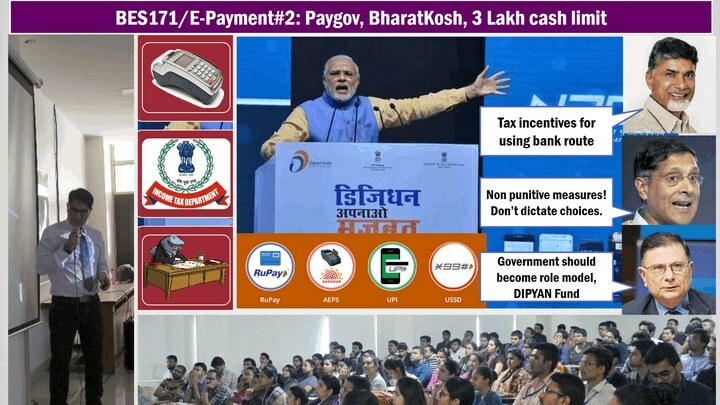 While Government of India launched two portals for e-transactions 1) paygov 2) Non-tax reciept portal BharatKosh, and launched Digital financial literacy campaign under HRD ministry, but overall, Government itself is not a role model when it comes to adoption of digital payment in internal functioning. Ratan Watal Committee suggested a new fund “DIPYAN” from the savings of digitization and use it for further promotion of digital payments. Chandrababu naidu suggested income tax relief for families using digital payments. Budget also used certain ‘carrot-and-stick’ approaches to make households, firms and political parties to use banking routes more than cash methods, this includes section 269ST, 217DA and other amendments in Finance bill 2017. NITI Ayog and NPCi also offering lottery schemes such as lucky grahak yojana for adoption of e-payment methods but is this sustainable in long run? Economic survey has some interesting conclusions. We’ll see all this in the present episode. Next lecture: we’ll start with evolution and classification of banking and financial intermediaries in India, including latest budget provisions and current affairs including Indian Postal Payment Bank (IPPB). Thank You, Sir! It’s helpful with PowerPoint here only. You always care for us. Love. A beginner will have to start with the basics. Go through L0-L10. guys plz reply. Validity of OBC certificate?? Sir, is bar pratik nayak sir ki koi lecture series aaegii kya?? Sir, whenever i try to pay for my application fee of exams like upsc , uppcs etc i am redirected to sbi portal where they only accept mastercard, visa and maestro card not RUPAY. even cse 2017 notification eplicitily mention to pay only via mastercard, visa debitcard. Sir if RUPAY’s father is NPCI and their stakeholders are banks like sbi. Why they dont accept RUPAY cards. Sir ppt BSE nii download ho rhi h please koi baataye kse hogi. Sir,when will these lecture series be completed? Approx. time..? You have been doing some great work! Just waitng for the next part of the series to be uploaded. And kindly let us know in how much time the whole series would be finished. Eagerly waiting for your reply. Sir, can we gt 2 knw how much more days it wl take before uploading the next videos in this series?? Sir, how much time it will take to cover this complete series of BES 171 , all 6 pillars . PLease upload your next lectures, eagerly waiting, btw, Pratik sir kaha hai, please request pratik sir to start his lectures which he has planned, please, please, upload your next lectures!! Please upload next budget lectures Sir. Earnestly waiting for them. Hope you are doing well and everything is fine. Prayers for you and your family’s well-being. Hey. Anything serious? What happened to Mrunal bhai? What happened to sir? Is he okay? You are not aware how eagerly thousands of students like me wait for your Economy classes and how much dependent people are on your extremely high quality classes. However the frequency of updation of classes on youtube this year has gone down this year affecting the flow of preparation. Requesting you to kindly look into it asap. Thanks a lot for all your efforts. please upload next lecture …….you had uploaded last ppt two weeks ago……..
ya wts d issue Suraj Mishra, do u have any idea?? pl upload complete series before rbi grade b 2107 examination . your video series is a boon for many of us.